The house is in the best possible position being the corner plot overlooking both the mouth of the Gouritz River and the Ocean. From a pathway at the bottom of the garden you can stroll through the dunes directly onto the beach and to the river. Because Gourtizmond is such a quiet place the wildlife abounds, bok, tortoise, hares and bird-life etc are all around you, the birds love to be fed, beware, once you start feeding them they will return and call for food. 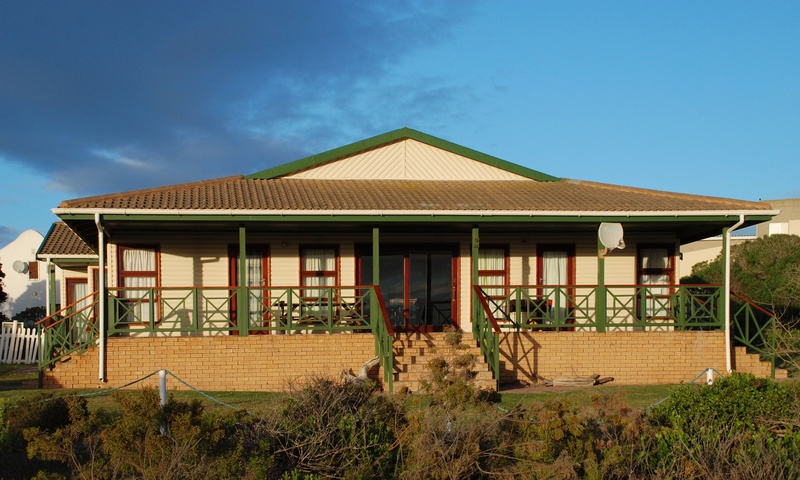 The house is fully equipped for self catering accommodation, there is a large moveable braai, tv (however, you must take your own DSTV decoder or one can be hired for the duration of you stay), duvets and pillows supplied (bring your own bed linen and towels). The house has five bedrooms, three en-suite and a family bathroom with shower and loo. Because all the bedrooms can be locked you can hire however many bedrooms you need along with the living areas and kitchen. For example if it just you and your partner are looking for a romantic getaway you will only need to hire one of the bedrooms, the other four bedrooms will be locked off and the house will be yours. However, if you want to take the kids, you may need an extra two bedrooms or if you fancy a big party, fill the house and hire all 5 rooms and the price is adjusted accordingly. Because of the location and size of the house it has been used on a number of occasions for weddings, anniversaries and other special events.